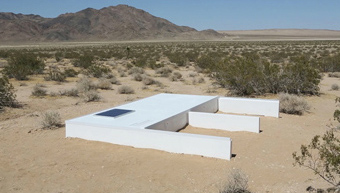 – visitors are advised that several hours of driving from Los Angeles, plus a willingness “to walk a long distance to reach the pool from the nearest road,” are required to reach the destination – its location nods toward the phenomenon of large-scale Land Art installations in deserts around the American West, like Walter de Maria's The Lightning Field in New Mexico, Robert Smithson's famed Spiral Jetty, or Nancy Holt’s Sun Tunnels in Utah. Conceived in the 1970s by artists in and around New York, already then the epicenter of the contemporary art scene, these works bore a critical response to and refusal of both the increasing commodification and institutionalization of art and the rampant destruction of the ecological environment. While Barsuglia's endeavor does share a palpable and explicit idealism as such – he suggests that the drive and walk to the pool should provide “time to reflect on social values, dreams and reality” – Social Pool is not a nostalgic affair. On the contrary, the work embodies the massive socio-economic changes that have taken place in the last forty years. It thus understands itself as the product of an economy in which privacy and immateriality have been fully commodified. For many a consumer, art is expected to operate according to the principles of the service economy rather than following humanist ideals of intellectual or moral stimulus and education. It is more important today that museum visitors have a good time while visiting than that they be educated, touched, unsettled. Consequently, the revival of live performance and contemporary dance in the museum has largely been simultaneous with its subversion into a sellable asset and tool of entertainment, despite its (former) intrinsic potential to circumvent commercialization. The title of Barsuglia's work alone attests to his acute awareness that Social Pool might operate in ways more similar to a yoga lesson or vacation away from it all than as an enlightened dialog with an enigmatic object: escapism rather than critique, digression rather than transgression. In line with the demands of the larger consumer society, Social Pool was conceived of as an experience encompassing a potentially transformative journey, a promise of relaxation, the peace of remoteness, all while staying tuned in. Social Pool is a sculpture that's a bath, an artwork both literally immersive and forcibly relaxing. Astutely intertwining semantic constructs like contemporary art, the pool (the symbol of carefree wealth, even more so in the desert), relaxation and nature, Social Pool is a complex replica of the contradictions and ideology of contemporary society, where remoteness from others and quietude are luxuries for the ever-communicating city-dweller. 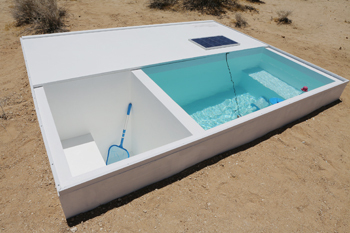 Barsuglia directly translates this desire for seclusion and individual enjoyment into the layout of the installation and larger concept of the project: GPS coordinates, otherwise kept secret, together with a key that opens the pool cover are provided to the willing visitor by the MAK Center for Art and Architecture in West Hollywood. In a feat of design and engineering, the pool cover also keeps the water from evaporating and serves, when opened, as an additional resting area. 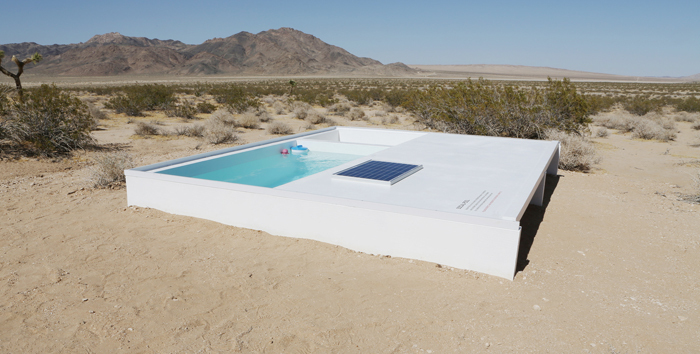 Bisected into two areas, one rectangular, one cubic, one filled with water, one dry (where visitors can change their clothes), the pool offers just enough space for one or two people to stand or sit on either of its sides (appropriately, a bench is built into each half). The walls of each pool segment are so high that the seated person cannot easily see whoever sits in the adjacent space, despite the fact that they are just next door. In a deliberate over-determination of the work's suggested idiosyncrasies, Barsuglia stipulated that only one person or small party at a time can use the pool, and for no longer than 24 hours. Social Pool closed to the public on September 30th 2014.